Graduate of any 4-year courses; Experience in manufacturing, preferably leader position is an advantage; Good in oral and written communication skills; Must be self-motivated; Can work under pressure; Must be willing to render overtime and work during holidays and on Sundays. Candidate must be a graduate of any 4-year courses; With good communication skills. Graduate of BS ECE and COE; Preferably with relevant work experience; Has good analytical, interpersonal and communication skills; Must be of good moral character. Male; 20 years old and above; High school graduate; With knowledge and work experience in a manufacturing firm; With measurement skills; Team player. Male; With valid professional driver’s license; Knowledgeable of the rod maps and traffic routes of Metro Manila; With expert driving skills (manual/automatic vehicle); Hardworking and willing to work overtime; Can speak / understand English language. 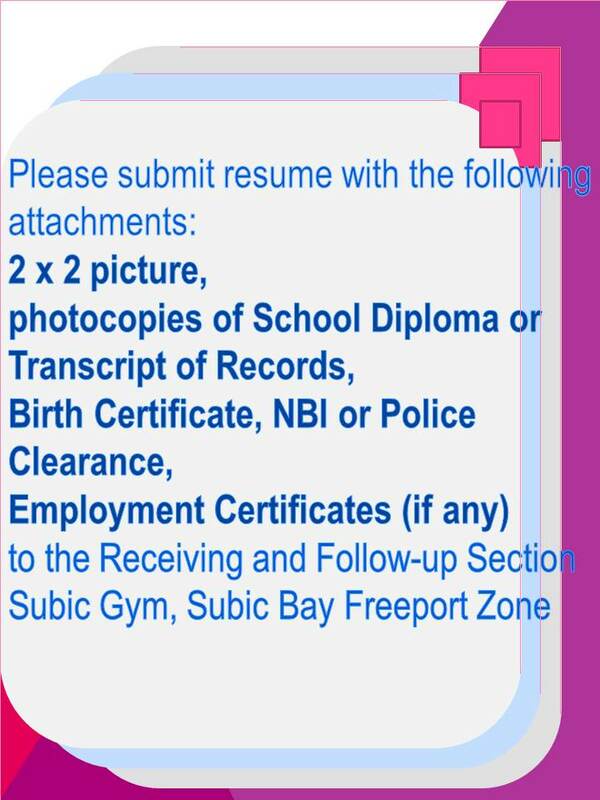 Male/Female; Candidate must possess at least a Bachelor’s/College Degree, Professional License (Passed Board/Bar/Professional License Exam), Electrical, Electronic, Mechanical, Mechatronic / Electromechanical or equivalent; With knowledge in Building and Facility Management; Can communicate in English and Filipino; At least 5 years of working experience in the related field is required; Preferably Assistant Manager / Managers specializing in Engineering, Civil / Construction /structural or equivalent. Male / Female; Graduate of BS Accountancy / Management or other relavant courses; With 5 years experience in similar / related function. Male; 35 years old and above; Graduate of Engineering; With related experience. Male; 35 years old and above; Bachelor’s Degree in Business Administration, supply chain/logistics; At least 2 years in inventory management is an advantage.